Welcome Japan’s hottest property and the international phenomenon known as Haruhism! It’s average schoolboy Kyon’s typical first day at an ordinary high school. Little does he know that his humdrum life is about to get a dose of the superfantastic thanks to fellow classmate Haruhi Suzumiya! Are you ready to join the SOS Brigade?! 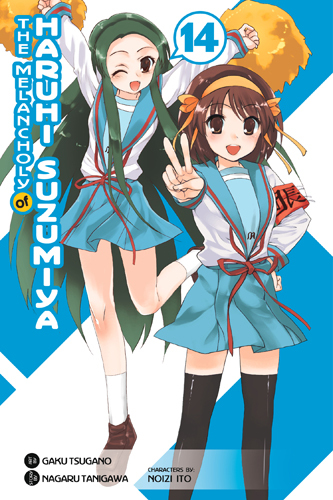 “Let’s track down aliens, time travelers, and psychics and hang out with them!” Haruhi Suzumiya established the SOS Brigade for that sole purpose. But why’s she been acting so strange of late? So…melancholy? Unable to locate any supernatural beings (even though they’re right there in the club room the whole time), Haruhi’s frustrations turn violent. What’s Kyon gotten himself mixed up in this time?! 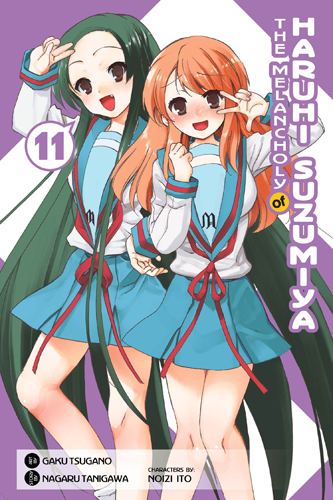 Enjoy volume 2 of this somewhat abnormal high school story! The SOS Brigade gets browbeaten into entering a baseball tournament to help their fearless leader stave off boredom. But despite the Brigade’s clear lack of skill Haruhi has no intention of losing…and she’s ready to pitch a fit if her team doesn’t step up to the plate! 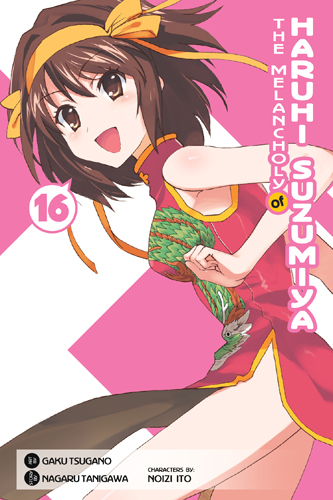 When the SOS Brigade receives an urgent message that the Computer Research Society’s president has gone missing, Haruhi confidently promises to locate him, and the SOS Brigade is off! It’s summer break, but not for the SOS Brigade! With only a month of vacation left, Haruhi has devised a plan to pack as much fun as possible into their final days of freedom. But is Kyon up for the “endless summer” Haruhi has in mind? Swapping her Brigade Chief armband for a director’s chair, Haruhi continues production on the SOS Brigade’s school festival film project. As she watches her half-baked plot acted out in front of her, Haruhi longs even more for the supernatural reality depicted in her movie. 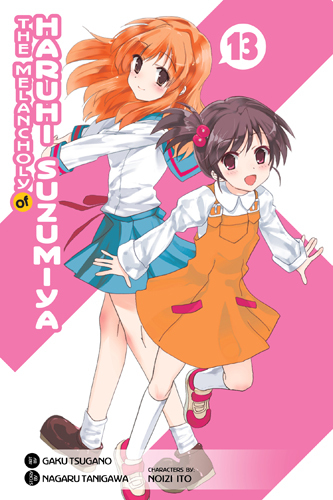 And for Haruhi, bringing her script to life is wholly possible…and inevitably dangerous! 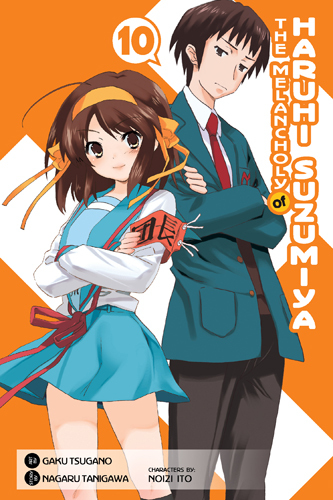 Something very, very strange is going on…because nothing strange is going on…Overnight, the SOS Brigade, the existence of supernatural beings, and Haruhi Suzumiya’s obsession with finding them (not to mention Haruhi herself!) have disappeared. Has the goddess lost her touch? And why is Kyon, who so often longed for a normal life, so upset to find all of it suddenly gone? Quite out of the blue, Kyon receives a phone call from his middle school classmate Nakagawa. Six months ago, he spotted Kyon walking with the most beautiful girl he’d ever seen and instantly fell in love! Now he wants Kyon’s help conveying his feelings. But Nakagawa has no idea that the fair maiden who stole his heart is actually an otherworldly being…Nagato?! How will the stoic alien react to Nakagawa’s affections?!  Trapped on the snowy mountain by both a storm and the supernatural forces that have cut off Yuki from the Data Overmind, Kyon is roused from sleep by Asahina slowly unbuttoning her nightshirt as she climbs into his bed! Kyon realizes it cannot possibly be the real Asahina (darn! ), and though he doesn’t mind the house’s tricks (who would? ), he and the Brigade have to crack the code and escape fast before Yuki’s fever (and Haruhi’s restlessness) gets out of control! After months of squatting in the Literature Club’s clubroom, the SOS Brigade puts pen to paper and starts writing some literature of their own! The Brigade has just one week to create a literature newsletter if they want to keep the Lit Club’s space from being reallocated by the student council. As each member prepares his or her contribution, Supreme Editor in Chief Haruhi keeps a watchful eye on her team, especially as Kyon’s assigned romance story unfolds! 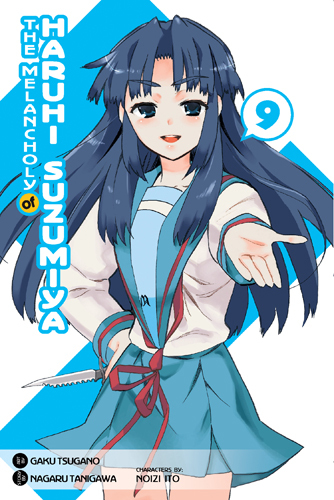 Guided only by a series of notes that direct him to do the most inexplicable things—“Buy a small turtle and throw it into the lake”?—Kyon and the Mikuru from eight days in the future complete these assigned tasks, hoping that things will become clear as the SOS Brigade’s adventures for that week continue. 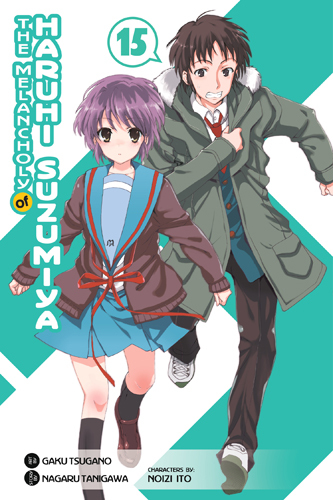 But Kyon and Mikuru’s scavenger hunt soon becomes a manhunt when Mikuru is kidnapped by a rogue group of espers, time travelers, and aliens! 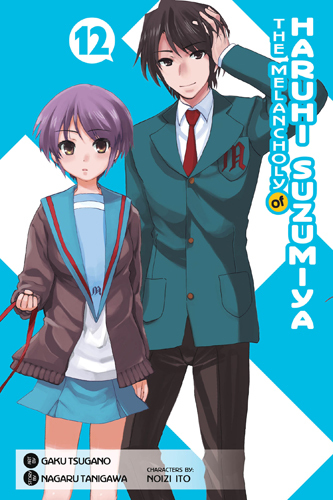 When a classmate notices that her dog is acting strangely on their daily walks, she asks the SOS Brigade to take on the case—a request Haruhi is more than happy to oblige! After all, any number of supernatural phenomena could be deterring local dogs from a particular area along the riverbank!